The 2016 Nobel Prize for Chemistry has been awarded for the development of the world's smallest machines. 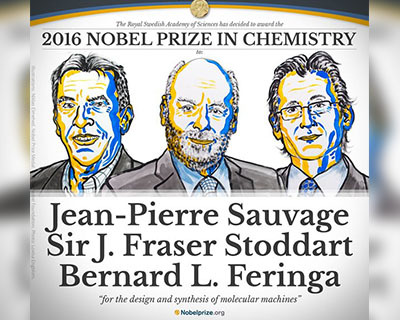 Jean-Pierre Sauvage, Sir J Fraser Stoddart and Bernard L Feringa will share prize for the design and synthesis of ‘machines on a molecular scale’. They have developed molecules with controllable movements, which can perform a task when energy is added. Knappily takes you to the world of tiny lifts and minuscule motors. The 2016 Nobel Prize in Chemistry has been awarded to three scientists for their ground-breaking work on molecular machines — tiny, man-made structures with moving parts capable of performing tasks. 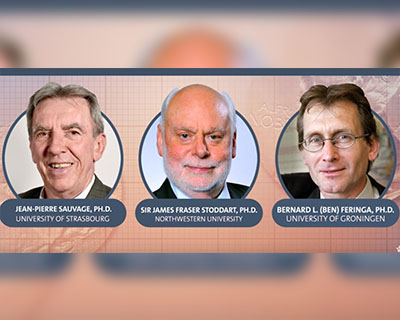 Jean-Pierre Sauvage, Sir J. Fraser Stoddart and Bernard L. Feringa share the prize equally. 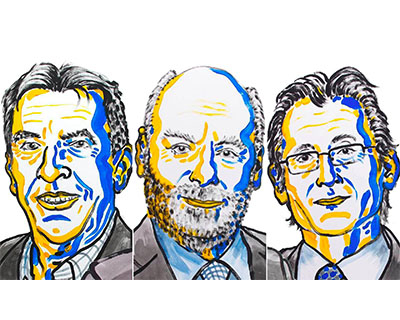 "Three laureates ... have opened this entire field of molecular machinery and shown us that you can make machine-like function at molecular level," said a spokesman for the Nobel chemistry prize committee. “Molecular machines,” the world’s smallest mechanical devices, may eventually be used to create new materials, sensors and energy storage systems, the Royal Swedish Academy of Sciences said in announcing the prize. Molecular machines are controllable, nanometre-sized structures that can convert chemical energy into mechanical forces and motion. These miniaturised machines are taking chemistry to a new dimension. Why do they deserve a Nobel? It may not be an exaggeration to claim that these three are the Henry Ford of the molecular world. Nanotechnology — the creation of structures on the scale of a nanometer, or a billionth of a meter — has been a field of fruitful research for a couple of decades. Now, scientists are learning how to construct tiny moving machines about one-thousandth the width of a strand of human hair. The first step to creating a molecular machine was making a moving part. 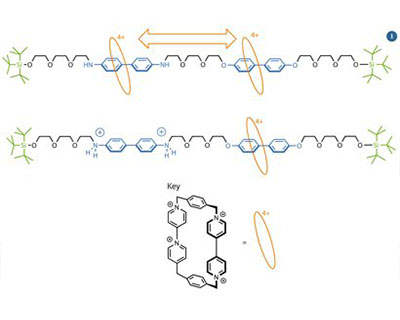 Chemists have long been able to synthesize ring-shaped molecules, and they knew that interlocking rings might function as molecular parts. Dr. Sauvage figured out how to create a second ring that passed through the first ring in 1983. A charged copper ion essentially acted as a pin around which to form the interlocking rings, he found. 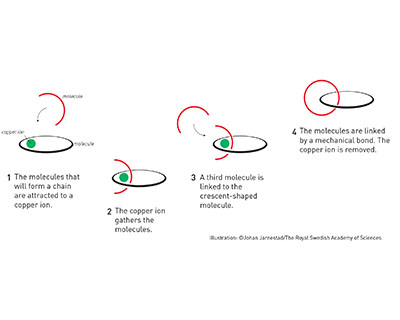 Once connected, the copper ion could be removed. These molecules became known as catenanes. 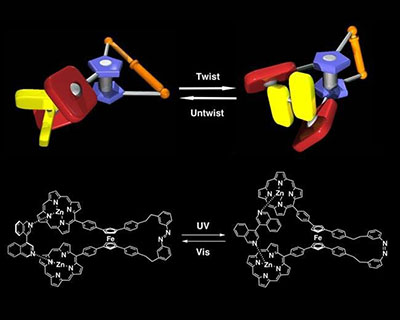 Instead of two interlocking rings, Dr. Stoddart, then at the University of California, and his colleagues synthesized rotaxane — a ring molecule wrapped around a dumbbell-shaped axle. The ring slides back and forth along the dumbbell, like a bead on an abacus. Dr. Stoddart went on to construct a small computer chip that was essentially a molecular abacus, as well as other complex devices. One was composed of three rotaxanes whose rings were connected to form a larger platform that could rise 0.7 billionths of a meter — a molecular elevator. Rotaxanes bending thin layers of gold acted like an artificial muscle, he found. Dr. Feringa, in 1999, became the first person to develop a molecular motor, creating a minuscule rotor blade powered by light that spun continually in the same direction. The first motor was not fast, but 15 years later, he and his research group demonstrated one that spun 12 million times per second. In 2011, they built a four-wheel-drive molecular “car” — four of the molecular motors acted as wheels, connected by a nano-chassis. When did these tiny creations become such a huge break-through ? That was a question asked by Nobel Laureate Richard Feynman, famed for his 1950s’ predictions of developments in nanotechnology, in 1984. Thanks to these three scientists, we finally know the answer:one thousand times thinner than a strand of hair. In other words, extremely, extremely, extremely small. Time has clearly shown the revolutionary effect of miniaturising computer technology, whereas we have only seen the initial stages of what could result from the miniaturisation of machines. Currently the development of these molecular machines is in an early stage, but the pioneering work of these three scientists is set to have a huge impact in the future. Chemists hope that one day these mini machines could be developed so they can deliver drugs within the human body directly to cancerous cells or target a specific area of tissue to medicate. It's like thinking of tiny robots that a doctor will inject in your blood veins which will then go to search for a cancer cell. Recent research into molecular machines has suggested that as well as killing cancer cells or transporting molecules for medical reasons, they could one day lead to the design of a molecular computer which could be placed inside the body to detect disease before any symptoms are exhibited. In terms of development, the molecular motor is at about the same stage as the electric motor was in the 1830s, when researchers proudly displayed various spinning cranks and wheels in their laboratories without having any idea that they would lead to electric trains, washing machines, fans and food processors. The potential of molecular machines is unimaginable. Where is the importance of their work? The three men invigorated the field of topological chemistry, the academy said on Wednesday. They were pioneers in the second wave of nanotechnology, a field that the physicist Richard P. Feynman, also a Nobel laureate, foresaw as early as 1959. He gave a seminal lecture in 1984, toward the end of his life, on design and engineering at the molecular scale. In living organisms, nature has produced a slew of molecular machines that ferry materials around a cell, construct proteins and divide cells.Artificial molecular machines are still primitive by comparison, but scientists can already envision applications in the future. The technology could also lead to the creation of “smart materials” that change properties based on external signals, Dr. Feringa said. Dr. Sauvage, 71, was born in Paris and received his Ph.D. in 1971 from the University of Strasbourg in France, where he is a professor emeritus. He is also director of research emeritus at the National Center for Scientific Research in France. Sauvage obtained his Ph.D. under the supervision of J.-M. Lehn (Nobel Prize in Chemistry 1987). During his PhD work, he contributed to the first syntheses of the cryptand ligands. After postdoctoral research with M. L. H. Green, he returned to Strasbourg. A prolific scientist, he has worked in several areas including electrochemical reduction of CO2 and models of the photosynthetic reaction center. 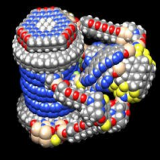 A large theme of his work is molecular topology, specifically mechanically-interlocked molecular architectures. He has described syntheses of catenanes and molecular knots based on coordination complexes. Dr. Stoddart, 74, was born in Edinburgh, England, and received his Ph.D. in 1966 from Edinburgh University, and is a professor of chemistry at Northwestern University in Evanston, Ill. He previously taught at U.C.L.A. and was knighted by Queen Elizabeth II for his services to science. Stoddart's papers and other material are instantly recognizable due to a distinctive "cartoon"-style of representation he has developed since the late 1980s.He was one of the first researchers to make extensive use of color in chemistry publications. Stoddart maintains this standardized color scheme across all of his publications and presentations, and his style has been adopted by other researchers reporting mechanically interlocked molecules based on his syntheses. He has published more than 1000 papers and holds at least ten patents. For the period from January 1997 to 31 August 2007, he was ranked by the Institute for Scientific Information as the third most cited chemist with a total of 14,038 citations from 304 papers at a frequency of 46.2 citations per paper. 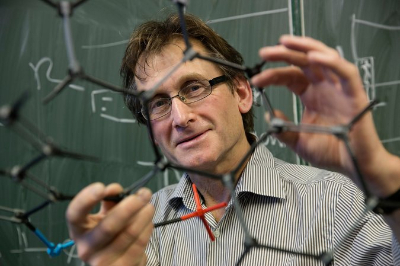 Dr. Feringa, 64, was born in Barger-Compascuum, the Netherlands, and received his Ph.D. in 1978 from the University of Groningen, where he is a professor of organic chemistry. Feringa’s research achievements range from fundamental contributions in modern stereochemistry and chirality to the rapidly developing field of molecular nanotechnology and dynamic molecular systems with seminal contributions to organic synthesis, asymmetric catalysis, molecular recognition and self-assembly. Ben Feringa holds over 30 patents and has published over 650 peer reviewed research papers to date, cited more than 30,000 times and has an h-index in excess of 90. He has guided over 100 PhD students over his career. How did molecules become machines? The parts that make up the tiny world of molecular machines are described using familiar terms:an alkyl chain might be called a piston, for example, or a benzene ring a wheel. Instead of nuts and bolts, molecular machines are held together by intermolecular forces; the subtle electrostatic attractions and repulsions between molecules. Chemistry is inherently dynamic, so these forces can hold molecules together strongly, but also enforce softer attractions, which pull molecules together, but still allow some degree of movement. And it is these softer interactions that are key to many molecular machines. The machine has a track with two stations and a shuttle that can slide along between them. The shuttle can't escape from the end of the track because there are bulky stopper groups at both ends which it can't fit over. The intermolecular forces that exist between the shuttle and the different points on the track determine where it sits. Under normal conditions the shuttle doesn't have much preference between the two stations, so it is free to move rapidly over the polyether chain and between the two ports. However, the machine is cleverly designed to change its properties under different conditions. The nitrogen atoms in the first station are basic. That is, they are easily able to accept a hydrogen ion (proton) on exposure to acid. In the process the first station gains a positive charge. This repels the shuttle (which also has a positive charge), and so the shuttle is pushed to the second station. What the chemists had made was essentially a switch. With the addition of a little acid, their machine switched from freely moving between both states to being confined at a single station.